Papa John’s, the pizza chain, said it was reevaluation its sponsorship of the NFL after the controversy involving protests by players during the playing of the national anthem engulfed the pizza maker. COO and President of Papa John’s Steve Ritchie said that if the decline in viewership continues, the company needed to shift into other things that are more effective. This week, founder and CEO of Papa John’s John Schnatter lashed out at the NFL, blaming the poor leadership of the league and the declining television ratings for the sales slump at the pizza chain. According to the CEO, controversy surrounding the protests by players has played a big role in the decline in ratings for the league. Former quarterback with the San Francisco 49ers Colin Kaepernick beginning knelling during the playing of the national anthem last season to protest police brutality and racial injustice. 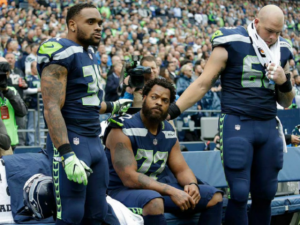 That controversy over his protests was renewed this past September after the President of the U.S. Donald Trump said NFL players who did that should be given their walking papers. Schnatter said during an investors call this week that the company was extremely disappointed the NFL and the leagues leadership did not resolved this continuing situation to the satisfaction of all involved. He added the problem should have been resolved more than 18 months ago. Currently, the football league is very important to the business of Papa John’s. The pizza chain started a partnership with the NFL back in 2010, and has a partnership of “Preferred Pizza” with 23 teams in the NFL. Last season the company inked a partnership of multi-years with the NFL as well as the Super Bowl. COO Ritchie denied emphatically that Papa John’s pressured the NFL to ban player protests. Instead, Ritchie said that the situation revealed issues with the decision by the pizza maker to invest aggressively in advertising on television, allocating a large percentage of its market budget for the fall and winter to the NFL. After a tweet by President Donald Trump late in September that players who kneel were disrespecting the flag and country, many supporters of his began canceling TV bundles with NFL games and burning merchandise. Many people this week rallied around the pizza chain after the comments made by Schnatter. However, backlash has hit the chain from progressives for blaming players’ protest for sales that are below par.